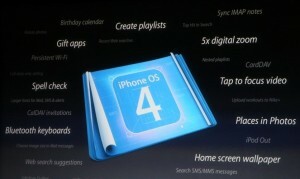 Apple today announced the most awaited iPhone OS 4.0 at a press event in US. The iPhone OS 4.0 includes around 100 new features. The prominent feature among them is the availability of multi-tasking. Multi-tasking will be valid for around 7 necessary services, which can be used by developers for new apps and additional features in existing applications. Apple also announced a new advertising model called iAd based on iPhone apps. Apple iPhone OS 4.0 will be available for iPod touch 3rd generation, iPad, iPhone 3G S and upcoming iPhone 4G/HD. Apple iPhone 3G and 2nd generation iPod’s also get some features of the iPhone OS 4.0, but not multi-tasking. The developer version of iPhone OS 4.0 download is now live at Apple website. The final build of the iPhone OS 4.0 will be pushed to devices by June of this year. The multitasking in iPhone OS 4.0 is designed in such a way that it doesn’t affect the battery performance of the device. Apple selected around must need 7 services and implemented multi-tasking capability. These services include background audio, background location VOIP, push notification, local notification, task completion and fast switching between apps. Developers can download iPhone OS 4.0 SDK and program applications based on these seven APIs. Therefore, the multi-tasking will be used only for some services, and not alike in other smartphone platforms that consume a lot of system and memory resources. The apps that are multi-tasking in the background can be opened by double clicking the home button. It popups a tray with all apps that are open and working. The background sound feature in iPhone OS 4.0 let users to hear online radio apps like Pandora in the background while doing other tasks. VOIP API can be used to operate Skype, Fring, Truphone and other apps while making calls, sending SMS or accessing other apps. The background location API in iPhone OS 4.0 is useful for people using the service like Google latitude and navigation apps. These applications can now monitor continuous the location of the user and update the data using GPS or cell tower positioning. Location service can be turned off from settings. Task completion in API in iPhone OS 4.0 is designed to aid certain apps to continue necessary processes in the background, even if they are minimized to tray. For example, the Flickr app can continue uploading photos, while the user is playing with some other app. The multi-tasking feature in iPhone 4.0 is only used by certain services in the apps. So we can switch out the apps in need and return to the original old state later, making use of the Fast app switching API. iPhone OS 4.0 comes with support for 5* digital zoom in camera. This feature might have designed for the upcoming iPhone 4G/HD. iPhone OS 4.0 will bring home screen wallpaper support in iPhone 3G S. This service, now available in iPad let users to customize the background of their phone with images they like. Apple will include the iBook app in iPhone OS 4.0 update. Now all iPod touch, iPhone 3G users can read ebooks on the go, and purchase new books from the iBook store if required. The new and existing iPhone, iPod touch will get Bluetooth keyboard with the latest OS 4.0. Apple launched a new game center with iPhone OS 4.0. The service is just like PlayStation network and Xbox live, that would be useful for game lovers to get into online games, along with leader boards and achievements. One of the most interesting features in iPhone OS 4.0 is the introduction of folders. Users can categorize all their apps, and drag them to folder spaces. 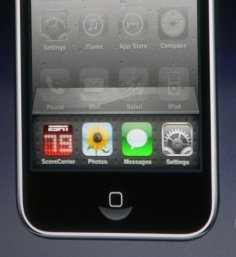 The 180 app spots in iPhone OS 4.0 home screen can include around 2160 apps. This improves the speed and access time to each application, and removes the mess from the home screen. Apple introduced an improved email app with iPhone OS 4.0. Here users can access Gmail, Yahoo, MobileMe and exchange accounts all in one single app. The email service support threaded messaging, and the use external applications to handle attachments. iPhone OS 4.0 includes so many features that would attract enterprise users. The Os 4.0 with better data protection features supports multiple exchange accounts, exchange server 2010, wireless app distribution and SSL VPN from Cisco. As we said earlier, Apple introduced a new ad platform called iAd with iPhone OS 4.0. Developers can now use the APIs and plugins to incorporate ads in their applications. Apple will host and mange the ad sales, and give 60% profit to the developers. Based on HTML 5, the iAds can be shown inside the app interface, without leaving to an external web page. It would be a great move considering the huge popularity of the iPhone in the mobile browsing index of US and several other countries. Other than those inbuilt features, the iPhone firmware update 4.0 arrives with around 1500 new APIs. Developers can access data using these APIs to create third party applications. The official iPhone OS 4.0 SDK is available for download here. 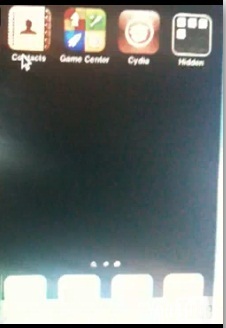 It would be possible to unlock/jaibreak iPhone OS 4.0. The iPhone Dev team and other hackers might start working on the new OS, from the first day to release an unlock/jailbreak solution. We also expect developers to leak the early builds of the iPhone OS 4.0 before that official release. We will post any download link if they are available. Update: Apple iPhone 4 announced. ha ha Microsoft removed multi-tasking from Windows phone 7, and now apple includes the same in iPhone OS 4.0. When they will release new iPhone 4G ? Nokia and Windows mobile introduced multi-tasking 5 years back, Palm and Android already have this. So why you guys are hyping around iPhone OS 44. ? I am not 4.0? much convinced about pushing multi-tasking to some services. I wonder how illiterate is these people to support iPhone and iPhone OS. Check out Wikipedia to know these features are already available or not. The only outcome of the recent Apple event is nothing but the same large number of blog post from bloggers and huge wastage of internet bandwidth. Be it iPhone OS 4.0, 5.0 or n.0, Apple should first teach themselves to respect others innovations. Mutual respect is good for industry and users. Dr. Martin Cooper should now sue Apple for creating a Mobile Phone. Please please Apple let others to build nice hardware and software. Why you are envying Android and Nexus One. And people, note that Nexus One, Droid (remember droid ads) are the main reason why Apple introduced multi-tasking in iPhone OS 4.0. The competition is good for customers. The business guys at Cupertino knows well to market iPhone and its future versions. That’s they limit iPhone, iPod and iPhone OS in its each update and create anticipation and hype among users for the next version. I also suspect that they are giving huge amount to media to support them. I have a couple of slots left in case anyone wants to try the new iphone OS 4.0. I can have you registered. Just send me an email with your UDID and Device Model.